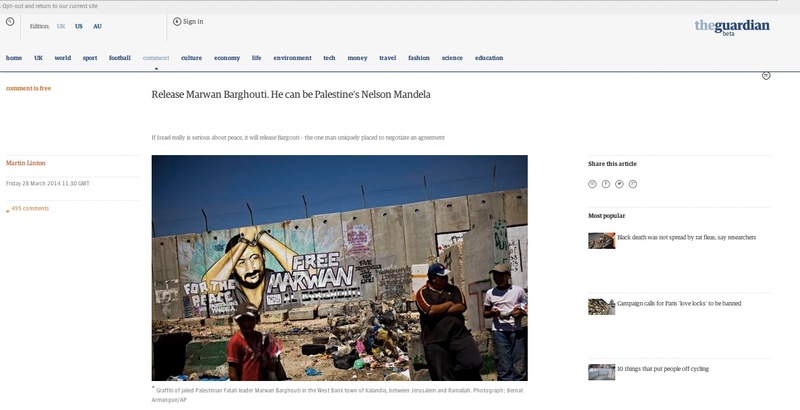 The Guardian published the following article by Martin Linton, on why Israel should release Marwan Barghouti for the future of the peace talks. Read our new Free Marwan Barghouthi pamphlet, calling for the release of the best known Palestinian political Free Marwan Barghouthi for web prisoner. The campaign was launched by the veteran South African ANC politician Ahmed Kathrada. Back in the 1960s Kathrada founded the first campaign to Release Mandela and was then jailed himself and spent many years on Robben Island. He returned to Mandela’s cell on Robben Island to launch the campaign to Free Marwan Barghouthi with Fadwa Barghouti, Marwan’s wife. Momentum is now growing behind the campaign which is supported by all the Palestinian political parties and human rights organisations and by the overwhelming majority of Palestinians as well as a constellation of former prime ministers and Nobel prize winners. To coincide with what should have seen the release of the fourth group of prisoners as part of the Kerry talks, we are launching a new pamphlet calling for the release of Marwan Barghouthi as part of the peace process. The death of Nelson Mandela reminds us that often the first step towards the resolution of a conflict is the release from prison of a national leader who has the authority to unite, to negotiate and to resolve. Mahatma Gandhi, Jawaharlal Nehru and Jomo Kenyatta are all examples of national leaders who were released by the British so that they could negotiate their countries’ independence. The pattern was repeated in South Africa when Mandela went from a prison cell to the presidents’ palace in just four years. It will be twelve years on April 15th since Israeli security agents, posing as ambulance workers, seized Barghouthi and took him to an Israeli prison. But even after 12 years in an Israeli jail Barghouthi remains one of Palestine’s most popular politicians – capable, according to the polls, of beating any other candidate for the presidency. Many believe he could come out of prison, stand for election, win the presidency, unite the Palestinian factions, negotiate a settlement, put it to his people, win their support and then preside over a process of “truth and reconciliation” in a newly-independent country. The Israeli government has postponed the Prawer-Begin Bill that would have forcibly relocated 40,000 Bedouin Arabs from their ancestral lands in the Negev to government-designated towns. But this is only a temporary delay for consultations. Demolitions of Bedouin homes are also continuing in Khan Al Ahmar and other areas in the Judean desert to the east of Jerusalem. The Britain-Palestine All Party Parliamentary Group welcomed a recent announcement that Israel will establish a pilot scheme to issue summonses to Palestinian children suspected of crimes, instead of using night time arrests. The cross-party group of MPs and peers called on the international community to ensure this happens as part of a complete overhaul of the system. The aim is to ensure that all child detainees are treated according to international law. A recent report by Military Court Watch, supported by UNICEF, found that over half of children held in military custody had been arrested at night. Details of the pilot programme to reduce night-time arrests– including who is supervising implementation, and the extent of the pilot’s reach, timeframe and monitoring and assessment – are not yet clear. The BPAPPG are therefore calling for Israel to provide further detail on the proposal, and implement the programme as swiftly as possible. It is at the point of arrest and the subsequent 24 hours when Palestinian children suffer the most traumatic experiences. The evidence shows that Palestinian minors when released from detention suffer from many types of trauma related conditions, including bed-wetting, aggression, lack of motivation, loss of concentration, anxiety and obsessive compulsive behaviour. The BPAPPG and Caabu have taken 12 Parliamentary delegations to the Israeli military court at Ofer. Both have pushed for an end to the use of night time arrests except in exceptional cases. In 2013, the issue of pilot programmes was raised with the Israeli authorities, who stated that the idea was under consideration. The BPAPPG state that an end to night time arrests must be part of a broader overhaul of the whole detention process that includes full audio-visual recordings of interviews, consulting a lawyer before interrogation and the presence of a parent throughout. The unemployment rate in Gaza Strip increased from 32.5% in the 3rd quarter 2013 to 38.5% in the 4th quarter 2013 while in the West bank it was 18.2% in the same period, according to the Palestinian Central Board for Statistics. This is not surprising given that the Israelis impose a near-total ban on exports from Gaza, leaving all but a handful of Gaza’s many factories mothballed. In the week ending March 28th there were only 6 lorryloads of exports allowed out, compared with a weekly average of 240 before the blockade according to UN figures. The Israelis also restrict imports to about a third of their pre-blockade level. In the same week 521 lorry loads were imported compared with a weekly average of 2,807 before the blockade. The unemployment rate for males was 23.1% compared with 33.5% for females. The highest unemployment rate in the 4th quarter 2013 was 43.9% among youth aged 20-24 years. For years of schooling, the unemployment rate among females with 13 years of schooling or more was 46.1%. The highest unemployment rates in the West Bank governorates was in Hebron with 25.3%. In Gaza Strip, the highest unemployment rate was in Rafah with 48.1%. I’ve got 3 minutes to tell you two stories which I hope will show you why this reform is needed and why it should have been done years ago. I’ve always found it ludicrous that we have 3,000,000 affiliated trade union members of the Labour Party, but we’re not allowed to know their names and addresses. Their affiliation fees are very welcome, but if we have 3 million trade union members it means we have on average 4,600 per constituency and their names and addresses would be gold dust to any MP, candidate or organiser, as would their participation in the local party. When I was an MP I used to ask my union, the GMB, sometimes to mail their levy-paying members on our behalf, which they did. In the end we asked the unions to invite members with postcodes in our constituency to a reception. And at this reception, for the first time, we met lots of working-class Labour voters who were affiliated members, paid money to the Labour Party, voted in Labour leadership elections, the very people who are missing from our membership. Secondly, in the 1980s I wrote a Fabian pamphlet in which I described the way trade unions affiliated to the Swedish Social Democrats – whole branches affiliated and all the members of the branch became members of the local constituency party – except for those who were opted out. I got a phone call from a newly-elected MP who invited me to lunch at the Commons to talk about changing the system of trade union affiliation. He was really keen on it. Now this MP – I don’t think I need to tell you his name – he did a lot of things I agree with, a few I don’t agree with – particularly on the Middle East, but he never got round to changing the affiliation system. So I think it’s to the credit of Ed Miliband and Paul Kenny and the other union leaders that they have done what Tony Blair failed to do. Of course we won’t keep all of our affiliated members. But the unions will still have political funds and they will still have an interest in getting a Labour government elected. That’s the glue that holds us together. It’s in the interests of the Labour Party to win trade unionists’ votes and it’s in the interests of the unions to get a Labour government elected. We don’t need the belt and braces of an antiquated system.